Euralarm members within standardisation body CEN/TC 72 are questioning the impact of a newly enforced standardisation procedure on the quality of fire detection products across Europe. They are determined to support CEN/TC 72 and work hand in hand with the European Commission for a joint solution on the long term. A recent letter of the European Commission’s DG GROW to CEN/TC 72 has raised questions among the members of the group, mainly representatives of the electronic fire safety industry and standard certification bodies, over their capacity to adapt to new standardisation procedures in their sector. The procedure also puts the safety of European citizens into question. The role of the technical body 72 of the European Committee for Standardisation, otherwise called CEN/TC 72, is to prepare standards to meet the essential requirement ‘Safety in case of fire’ of the Construction Products Regulation (CPR). The CPR is a European Union’s legal act which has been since 2011 the regulatory background for standardisation in the field of fire detection and fire alarm systems in and around buildings. The official European Commission letter informed CEN/TC 72 members about the discontinuation of pass/fail criteria used when testing fire detection and fire alarm systems. The pass/fail testing approach is contrary to the one favoured by the CPR, based on classes of performance’. One potential impact would be for example on the colour of alarm manual call points, the traditionally red buttons found in public buildings which activate fire alarms manually. Under the performance approach, each manufacturer could choose a different colour for its manual call points, unless a ‘delegated act’ is issued with the agreement of all Member States and scientific evidence has been provided to back the new regulation. 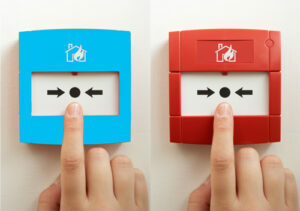 The performance approach supposes greater regulatory prerogatives for EU Member States: from Euralarm member’s standpoint, this endangers the Single European Market for electronic fire safety and security products and could result in lower levels of safety for EU citizens depending on their country of residence. Additionally, the newly enforced approach introduces an additional red-tape burden on small and medium-sized enterprises (SMEs), which form a substantial part of the sector. While work on several standards is now partially on hold, a sub-task group within CEN/TC 72 has been created to solve the issues raised by the newly enforced standardisation approach and work in close collaboration with the European Commission towards a solution. Euralarm is represented in the sub-task group and offers its support to any long term solution to the new standardisation approach.